By February 1844, the South Eastern Railway had began running train services between London Bridge and Dover, via Redhill and Tonbridge. Parliament had decreed that the company had to share the lines of the London & Brighton and London & Croydon Railways to reach the London terminus, this of which sparked many a dispute over running powers. Having been compelled to take a Weald of Kent route for the main Dover trunk route, and deciding not to extend the 1849-opened North Kent Line eastwards over the Medway to Chatham, Gillingham and ultimately, Faversham, another separate concern known as the ''East Kent Railway'' was formed. This independent company was established to promote the railway interests of Faversham, by providing the growing town with a railway connection to London. By 1860, this had been achieved and the company (now the LC&DR) was becoming an increasing threat to SER traffic. By July 1861, the LC&DR had reached Dover by a decidedly shorter trunk route from London, via Faversham. In response to this, the SER decreed that it had to shorten its London to Dover line to fight off the competition and, on 30th June 1862, the company was authorised to build a new cut-off line from North Kent Junction (where the North Kent Line leaves the original London & Greenwich route) to Tonbridge, via Sevenoaks. This would reduce the London to Dover journey distance by a crucial 12½ miles. Chislehurst was reached on 1st July 1865, followed by Tonbridge on 1st May 1868. Come the late 1850s, the North Kent Line was suffering from serious cases of congestion and the SER decided upon constructing a second line between Dartford and London. This was to be routed via Sidcup and join the existing cut-off line from North Kent Junction to Tonbridge, at Hither Green. Opening of the line, dubbed the ''Dartford Loop Line'' came on 1st September 1866, providing a more direct route to the capital. A station was not built at this point of convergence until after the opening of yet a third North Kent route between Dartford and the capital, this time routed through Bexleyheath, although the line had no direct physical connection with either the Dartford Loop or Tonbridge cut-off lines. 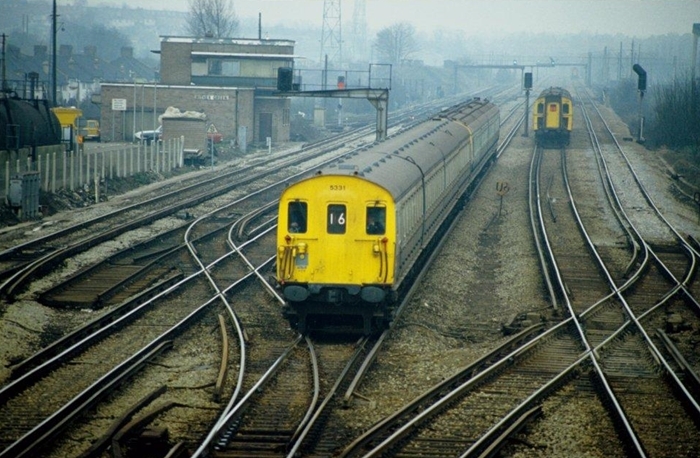 The Bexleyheath line saw its first passenger services commence on 1st May 1895 and exactly one month later to the day, a station at Hither Green was opened, serving both the suburban Dartford Loop Line and the main line via Tonbridge. The 1895 station comprised four platform faces, two on the curve of the Dartford Loop Line and another two serving the Tonbridge cut-off line. By this time the SER was in full swing of providing ''economical'' stations, but the main station building to the north of the suburban platforms was actually a single-storey brick-built affair, as was the Station Master's nearby house. The former was based on the attractive red brick design which had first been introduced by the SER (implemented by this company at Ashford and Shorncliffe, to name but two), and subsequently perpetuated by the SE&CR, the design appearing at Waterloo Junction and Chislehurst. Just before the 1899 amalgamation, more station buildings were erected to the south of the main line platforms, again of brick construction (to the same design), but with clapboard extensions. Excepting the aforementioned entrances, the whole station was rebuilt in conjunction with the St Johns to Elmstead Woods quadrupling of 1905, these lines coming into service on 18th June of that year. 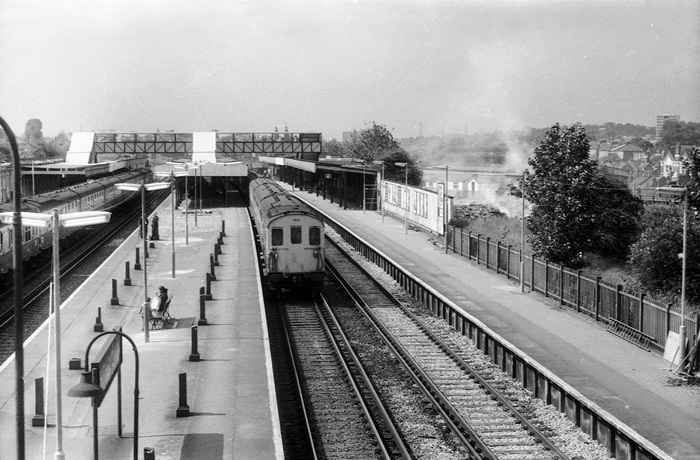 Hither Green now featured six platform faces, two of which were situated on an island: the main line platforms were linked by a subway, but interestingly, those suburban platforms for the Dartford Loop Line were linked by a covered lattice footbridge. 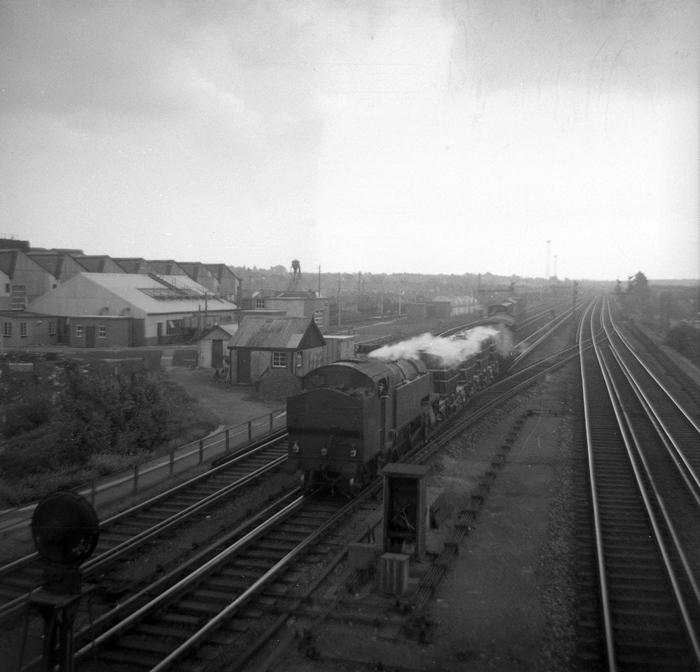 A novelty of the suburban side was the inclusion of a third ''through'' track, but since most services stopped here and freight along this particular curve was light, it was little used by traffic and until its removal by the Southern Railway in 1937, was used more often than not to stable rolling stock. By Nationalisation a footbridge had been provided at the southern extremities of the main line platforms as an alternative to the subway; the suburban lines still retained the original covered lattice structure. Electric multiple units had been serving the station since 28th February 1926, when third rail was installed between the ex-SER London termini and Orpington as part of the Southern Railway's scheme to electrify those suburban lines of the former SE&CR. This was followed on 19th June 1926 by the commencement of electric services to Dartford via all three North Kent routes. The first signs of change under British Railways came in Spring 1955, with the lengthening of the Dartford Loop Line platforms at their eastern ends with prefabricated concrete. This was undertaken in connection with the commencement of ten-car EMU formations, the first scheduled rush-hour trains of this length beginning on 13th June of that year. Concurrent with this, the northern platform of the ''main line'' station saw its canopy totally rebuilt in metal and asbestos. 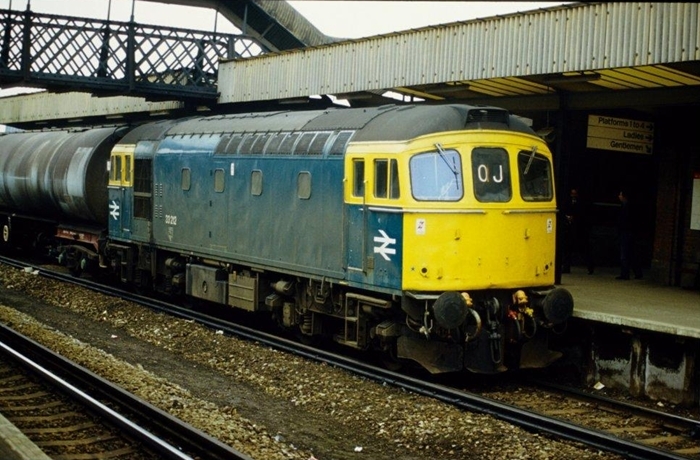 Then, in 1962, the removal of semaphore signals and the installation of four-aspect colour lights took place, in preparation for the electrification beyond Sevenoaks to Tonbridge, Ashford, and Dover. Mechanical signal boxes ''A'' and ''B'' - both of all-timber construction and of SER design - were also decommissioned as part of the re-signalling programme, and a new ''power box'' was subsequently built between the running lines and Hither Green Depot's entry roads, this coming into service on 4th February 1962. Then, in the early 1970s, an extensive station rebuilding programme began, which saw the ''main line'' canopies cut back by over half their length, and even then the remaining sections were rebuilt with new valances. A new footbridge was provided between these platforms at the London end of the layout, that at the south subsequently going out of use, but the original subway remained open. The canopies of the Dartford platforms were also totally obliterated, but the distinctive covered lattice footbridge remained, this now existing as the oldest structure on the site. Station rebuilding was completed in 1974, the northern station entrance having now been demolished, along with the Station Master's house, and that at the south totally rebuilt. Apart from the replacement of asbestos cladding with corrugated metal in 2003, little has changed at this station since the rebuilding. in-between the two sets of double-track. The ridge-and-furrow roof on the left is that of the engine shed.